Think of an issue that makes your blood boil. Now imagine lunch with a friend who is just as passionate about it—on the other side. How can the two of you even broach the issue, let alone hear each other with curiosity and compassion? Examine the obstacles that keep you from dialogue: black-and-white thinking, a Ҥistraction lifestyle, the fear of change and negative impressions from others. Explore the strength of character from which healthy dialogue springs—and the work of the soul that cultivates them. Learn practical guidelines for dialogue and how they work in an imperfect world. Encounter anecdotes of dialogue in action, from resolutions of interpersonal conflict to difficult dialogues on some of the most divisive issues of our age. Use provocative questions at the end of each chapter to stimulate group discussion and individual reflection. Why the interest in dialogue? I’ve always been conflict-averse. Rodney King’s famous line “Can we all get along?” could be my mantra. At first I may have seen dialogue as a nice, pleasant way to avoid conflict. Only later did I begin to see the beauty of dialogue for what it is: a path through conflict that fosters empathy and compassion—a way to bridge the persistent divides that fracture our society. So, why can’t we talk? And what can we do about it? There are so many factors involved. As a culture, we’re caught in a cycle of anger and polarization that just seems to be getting worse. As individuals, we often fear dialogue because it makes us vulnerable. What if we find out we�re wrong, especially about a conviction we’ve built our lives around? Most fundamental, though, is our fight-or-flight response: if we perceive someone else’s opinion as a threat, our instinct is to act like our ancestors before a charging mastodon—run like mad or stand and fight. It’s so human to react this way. I notice the subtitle of the book includes the word Christian. What’s in there for non-Christian or non-religious readers? The goal is to draw from the treasures of the Christian tradition—particularly ancient monastic practices like silent prayer and contemplation—in a way that can benefit anyone. A good deal of the book is devoted to other paths to inner transformation, such as fundamental mindshifts and practical steps to engage our world. Any reader can use these paths right away. In what areas of your life does dialogue happen most naturally for you? Where do you find it a struggle? How do you seek to promote dialogue in your own life? How has this chapter changed or enriched your understanding of dialogue? With what in this chapter do you disagree? Why? How do you see the future of the Church, particularly with regard to the controversies that currently divide it? Can we still preserve the unity to which Jesus calls us, and if so, how? How do you see the future of your church or denomination? Could you be a catalyst for change or reconciliation on the issues that divide the Church (or your church)? How? What gifts do you have that would lend themselves to this type of effort? Some of the scripture passages quoted in this chapter—like the story of the Canaanite woman, or “I have not come to bring peace, but a sword”—are difficult for many of us. How do you interpret them? How do you connect them to the broader mission of Jesus? 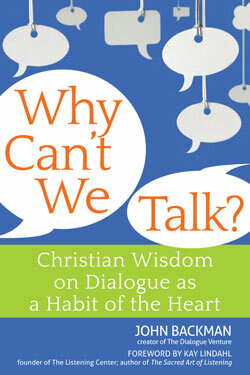 Consider the obstacles to dialogue presented in this chapter. Which influence you the most? How could you overcome their influence in your own life? How do you use language to support your convictions? What are some of your favorite catchphrases? How could you reword your favorite catchphrases to shed more light on your beliefs—and open the door to dialogue? What other obstacles to dialogue come to mind? What kind of influence do they have on you? on the state of dialogue in our society? What are your most cherished beliefs? Why do you cherish them? What do you consider the greatest threat to these beliefs? How (if at all) could you see that threat as simply another perspective? Is it appropriate to do so? Do you belong to a faith community? If so, how do the beliefs of the community support—or challenge—your own beliefs? How (if at all) does it nurture the virtues of dialogue in your soul? If not, where do you seek out the benefits of community for your own life? How does it help you to grow? Choose one of the spiritual disciplines listed in this chapter to try for a week—or, even better, a month. (See the appendix for basic how-tos.) What draws you to that practice? How do you think it will affect you? Take notes to share with the group about insights you gather and any difference in you see in yourself or the way you see the world. Think of a time when you suddenly saw the merit of someone else’s argument or belief. How did you feel? How did you react? What happened to the conversation? What lessons can you take from that experience into the rest of your life? Various words, phrases or observations strike different people in different ways. How do the three phrases in this chapter strike you? What other phrases or mind-sets might help you become more oriented toward dialogue? Take a fresh look at your news sources. Evaluate them from as many perspectives as you can think of: conservative versus liberal, social conservative versus economic conservative, atheist versus evangelical and so on. What are the strengths of your media diet? What news sources would help you balance it? What foreign country fascinates you? What would it take for you to travel there, to learn its language or to explore it online? How many of your good friends are not like you? In what ways? How could you broaden your circle to broaden your perspective? What part of your community lies furthest outside your comfort zone? What would happen if you volunteered in that area or with those people? Whom did you choose for your first dialogue partner? Why? Think of an issue about which you are wildly passionate. Now imagine sitting across the table from someone who believes exactly the opposite of the way you do. How could you reframe the issue to arrive at common ground? Does this reveal any new insights about the issue at hand? Think back to the last time someone completely misunderstood a word or phrase you thought was common knowledge. How did the person react? How did you react? What did you do to clarify what you meant? How would you handle this kind of situation the next time it arose? What might happen if, the next time you meet with someone who dislikes your opinions, you start by discussing the funniest lines you’ve ever heard in a meeting? How could you build on that to make progress in your dialogue with that person? Search your memory for a discussion that went awry. Why did it fail? What good things came out of it? Consider one of the polarizing issues of our times: gay marriage, for instance, or war, or capital punishment. What are the shopworn arguments that characterize each side? How might we reframe the issue to foster dialogue? Come back to the issue about which you are wildly passionate and the people with whom you disagree (which you defined in response to the questions from chapter 7). What kinds of policy initiatives or volunteer activities could you take up together that might allow you to see one another�s humanity? Did you learn other lessons from the sample dialogues we explored in this chapter—lessons that did not come up earlier in the book? What kind of lessons? Consider the other side of a topic discussed in this chapter: abortion, LGBTQ issues or evangelism. Without judging, see if you can fathom the line of reasoning behind it. Seek out a website that attempts to lay out the position in a civil manner (ProCon.org is an excellent place to start). What do you hear in this position? Can you see how a reasonable, goodhearted person might come to that belief? How might you open a dialogue with such a person? What other topics would you consider “war zones”—conflicts that have raged with seemingly no hope of dialogue? How would you start a dialogue on these topics?